This one is more straight-forward. In the previous tutorial, we created a character with 2×2 blocks set and then painstakingly painted them on the screen using code. In this part, we’ll start by creating a TRSE level that will later automate the rendering process. First, make sure you have a character set with 2×2 blocks at hand. We’ll be using the one that was created in part 4. In addtion there will be chunk size*data chunks = 64 bytes extra per level that you can fill with whatever info you need – monster information, items etc. There are levels x*levels y levels in total = 16 * 267 = 4304 bytes in total. 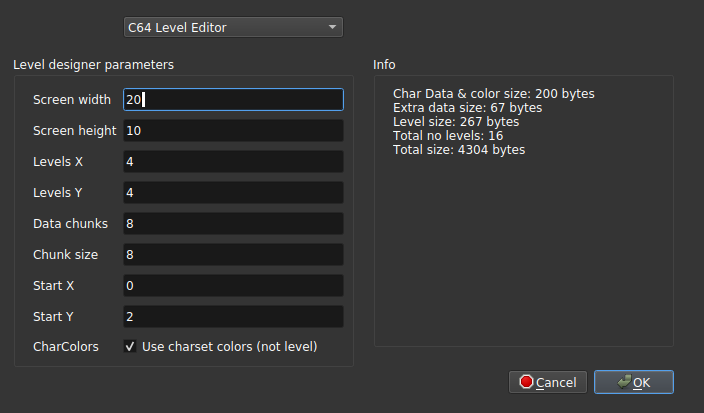 Click OK and start by saving your new file to a new directory “levels/level1.flf“. The next important thing to do is define your character set. Click on the “charset” tab and use the “load charset” button to load your previously created character set (like charsets/charset1.flf). You can select your current character by clicking on one of the character icons on this tab. But first, we need to decide on a better-looking suite of multicolors for this particular screen: in the “colors” tab, select some suitable multicolor 1 & 2. Make sure to save your file! In the next tutorial part, we’ll be including this .flf file in Turbo Rascal SE and hopefully be able to render the levels correctly.